Located in the north nave aisle in Carlisle Cathedral is a monument to Francis Close. Born in 1797 in Corston Somerset, Francis was the youngest son of a noted agriculturalist – Henry Jackson Close. Francis graduated from St John’s College Cambridge in 1820 and became the first licensed curate of Holy Trinity Church in Cheltenham in 1824. He remained Perpetual Curate of Cheltenham until 1856 and during his ministry in the Gloucestershire parish, Francis erected a cemetery chapel and four district churches. Following a near fatal accident in Geneva in 1855, Francis reduced his workload, sermons and attended few public meetings. 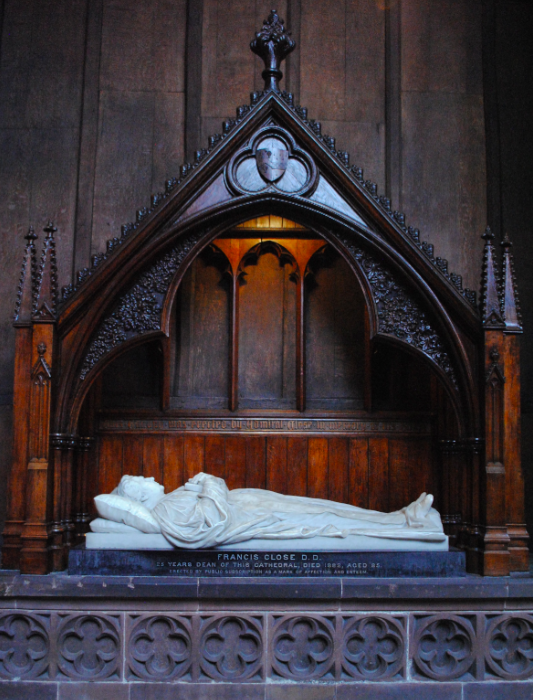 In December 1856, Francis became Dean of Carlisle Cathedral – a post which he held until 1881. The marble effigy depicts the Dean clutching a bible over his chest with his head supported by pillows. The monument sits within a carved Gothic canopy and is the work of the 19th century English sculptor Henry Hugh Armstead.